Specials good 9/27-9/30/2017 or while supplies last! 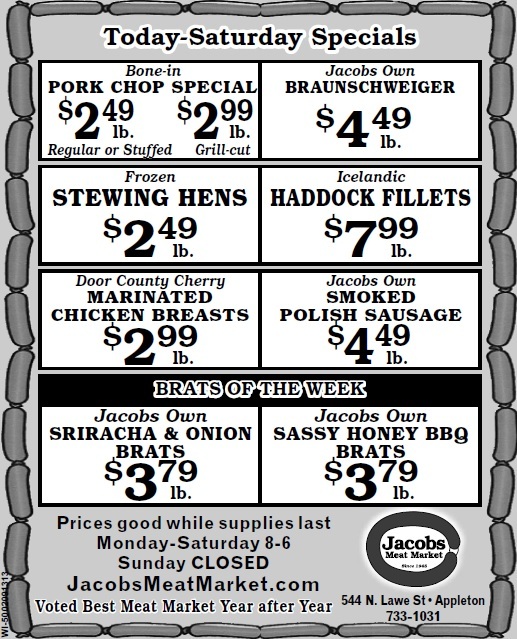 Jacobs own Smoked Braunschweiger (made with Jacobs own Bacon) to Frozen Stewing Hens (to make it feel more like Fall ;)) and Icelandic Haddock Fillets we have you covered! 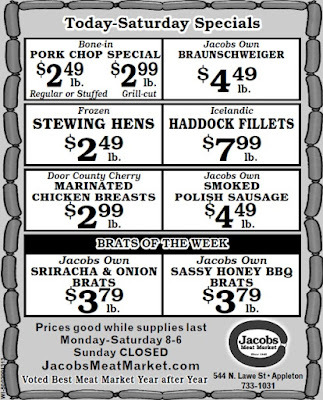 We also have Bone-in Pork Chops on special for great prices and Door County Cherry Marinated Boneless Chicken Breasts. Lastly, we have our Brats of the Week, which are Sriracha & Onion and our Sassy Honey BBQ Pork Brats, both spicy and yummy!! A guy is 86 years old and loves to fish.He was sitting in his boat the other day when he heard a voice say,"Pick me up." He looked around and couldn't see any one. He thought he was dreaming when he heard the voice say again "Pick me up." He looked in the water and there, floating on the top was a frog. Then, kiss me and I'll turn into the most beautiful woman you have ever seen. I'll make sure that all your friends are envious and jealous because you will have me as your bride." Then the frog said, "What, are you nuts? Didn't you hear what I said? I said kiss me and I will be your beautiful bride."